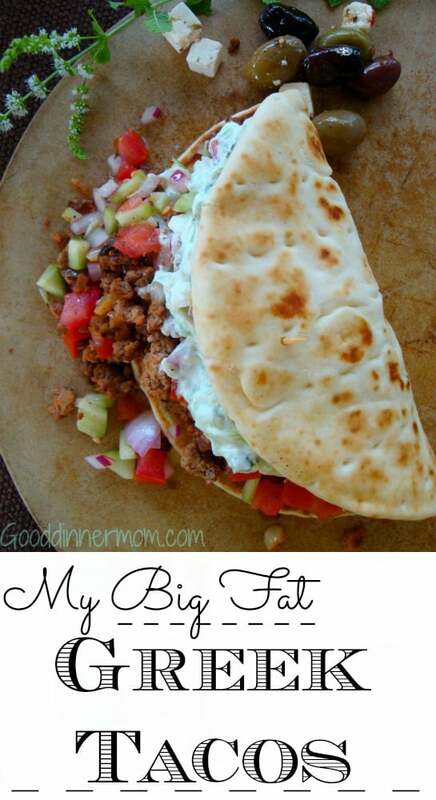 This is one big fat Greek taco for sure! A gyro and taco all in one. And delicious, hearty and satisfying all in one too! Customize your own condiments if you like, but the Mint Tzatziki and Tomato-Cucumber Relish are essential to the Grecian vibe in this sure-to-be-a-regular on your go-to menu. 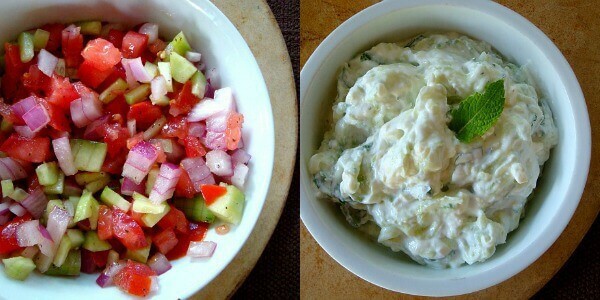 The relish and tzatziki can be made ahead, in fact I think it’s necessary for the flavors to marry before serving. So, make both condiments at least an hour ahead of time or even the night before. A few variations to try: Serve with hummus instead of the tzatziki for a dairy-free option if that matters to you. Or include the hummus and the tzatziki because both are fabulous! The recipe calls for (and pictured) Greek no-pocket pita bread, but you could use pocket bread which would be especially easy at a party, or serve salad-style with no bread at all! For extra veggies per serving; as the meat is finishing, seed and chop an additional tomato, add to the meat mixture and cook just until the tomato breaks down. These Greek tacos will be perfect at a buffet-style party. The entire meal can be made ahead. Just reheat the meat (this could be done in the crockpot so it stays warm during multiple trips to the buffet line), griddle the pitas quick and set it all out for your guests to pile everything together. As written, the recipe serves four and we were able to make the tacos into extra generous portions with lunch leftovers. Cook’s update: I just made these for a very large crowd and here is a tip to follow for the best flavor. Have the meat ready at least 4 hours before the party. Place in a crockpot on low for 4 hours and the juices/flavors will just increase until when it’s time to serve. I made both condiments the morning of the party also for optimum flavor. The recipe can be made with ground beef (our favorite), lamb or turkey. And, as if the tacos aren’t delicious enough, look what you can do with leftovers. 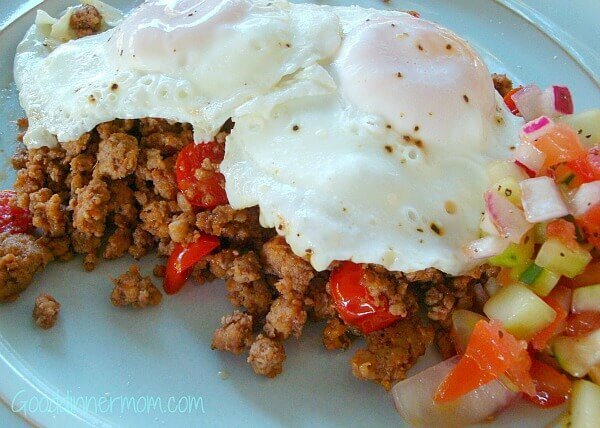 A healthier alternative to corned-beef hash. 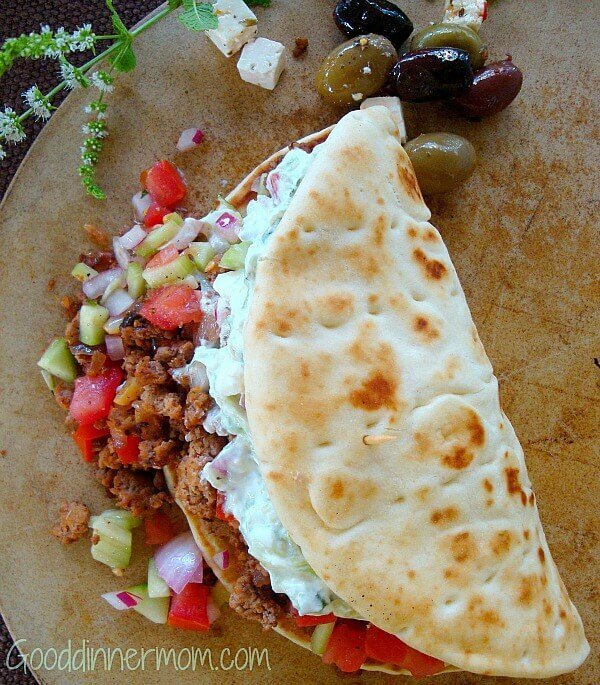 These Greek Tacos will be the hit of any party buffet or family weeknight dinner. Make the relish and tzatziki the night before if you like for even more low effort prep time. The flavor is over-the-top and sure to be requested again and again. If making for a party or large group, after the meat mixture is finished, heat on low in a crock pot for 4 hours to increase the flavors and seasonings. Cook's note: This is not necessary for yummy impressive flavor, BUT if you happen to have a little Za'atar seasoning, add 1-2 teaspoons to the oregano when cooking the meat mixture. 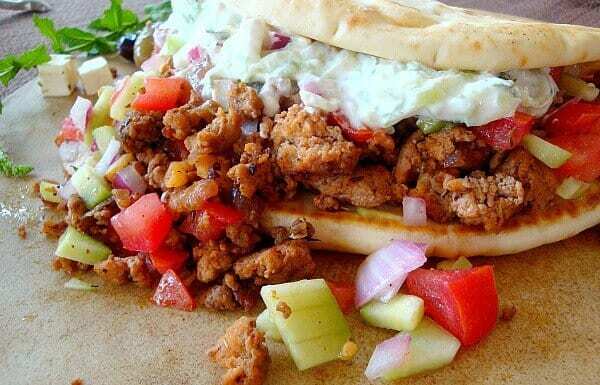 It will add just that much more out-of-this-world Greek gyro flavor. I have made it without and had huge success. Toss the olive oil, vinegar, tomatoes, cucumbers and onions in a bowl and adjust the seasoning if necessary. Cover and let sit at least 1 hour to marry the flavors. Seed and then finely dice the cucumber and place in a fine-meshed strainer or cheese cloth fitted over a bowl. Salt the cucumber and let sit 10 minutes. Then squeeze out any excess moisture. Add the strained cucumber into a bowl with the yogurt, feta, garlic and mint. Adjust the seasoning if necessary. In a large skillet, heat the oil over medium-high heat. Add the ground meat, sprinkle with salt and pepper and cook until the meat gets nice and golden brown, 10 to 12 minutes. With a slotted spoon, remove the meat and reserve. Lower the heat to medium and saute the onions in the lamb juices until soft, about 5 minutes. Add the oregano and garlic and cook until fragrant. Season. Add the tomato paste and cook until it caramelizes. Deglaze with the red wine and scrape any bits up that have adhered to the pan. Add the meat back in, stir and keep warm. In a cast iron or other heavy skillet, drizzle a small amount of olive oil and heat to medium high. Place pita in pan and heat each side for just about 20 seconds. Serve buffet style with extra feta, if desired. My husband and I have made this recipe three times in as many weeks and it’s just fantastic! We sub za’atar for all of the oregano (might be a bit strong for some) and serve on couscous, so easy to throw together bowls of this on weekdays after work. Just delicious, thank you! This was delicious! Kids said it tasted just like a Gryo. I thought I made enough for two days, I am going to have to double the recipe next time. I also had enough to make a hash for breakfast. Yes, this is definitely a winner! Thanks Meril! So glad you all liked it. I appreciate you taking the time to stop by and comment, it means a lot. Made this last night for a christmas party, it was delicious. The Za’atar seasoning really puts it over the top. I used red wine vinegar and it turned out amazing. I threw the yogurt sauce in the blender because of picky eaters and it was fantastic blended up (I added extra yogurt and it still worked great). This is a great meal and we’ll be repeating it. Family requested I remake it tonight 🙂 Thanks! Molly, I love that idea about blending the yogurt mixture to smooth it out. I’m definitely going to do that next time. Thanks so much for taking the time to comment. Great way to make it simple and adaptable, Leslie! I’m going to add your “stand ins” to the recipe because sometimes we don’t have everything on hand or sometimes we just want to make things easier. 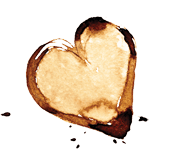 Thanks so much for making the recipe and for stopping by to comment. It means a lot. This is my family’s favorite meal 🙂 We’re making them (again!) for New Years Eve dinner. Thank you so much for this wonderful recipe! I used red wine vinegar instead of red wine in the meat as the recipe suggested and it was terrible. So acidic! I had to add some sweetness to balance it out. Also finely dicing the cucumber for the tzatziki did not work, grated would be better. I definitely want to try it again but this time I will use red wine, grate the cucumber, and try out the Za’atar seasoning. Make these often for our family but usually use the soft “taco boats” for this. Sometimes it’s a “bowl/salad” recipe. As a former food prep teacher, I am particular about blog recipes.? Thanks for sharing! Hilda, I am honored that you feel my recipe is worthy of your time. I too am picky about the blog recipes I seek out. Thanks so much and I’m glad you like it. I’ll have to try the “bowl/salad” myself. Done. Thanks for catching that. As you can see by my other recipes, I always give outbound links. I must have missed the link up in my credit at bottom of recipe. I LOVE Greek food, and these tacos are making my mouth water!! These were fabulous. I never heard so za’atar so I bought some just for this recipe. I also made my own pita bread since I was never crazy about the dry, tasteless store bought things. Happy to say those turned out great, too. I’ll be making these again next week. Thanks for a great recipe. My husband and I just made these tonight. I made homemade pitas because I find the store bought are always too dry. This recipe is absolutely amazing and delicious. We decided it’s becoming a staple in our house!! Thanks Andi, we love these greek tacos and I hope you do too! We looooooooved these, Sally! Awesome recipe! Thanks so much for answering all my questions today too. You’re the best! Just made these for dinner, and they were absolutely delicious! Thank you for sharing this recipe. I just made the tzatziki and the relish both already taste amazing. I am making this for dinner tonight but I am making the pitas myself as well. Cannot wait to try the whole meal! Homemade pitas!! You are my kind of gal, Karlette! I’m so excited to have found your site as you seem to have similar healthy eating goals as we strive for and your recipes look amazing! I can’t wait to try this one soon as we love Mediterranean-inspired foods. Thanks for sharing! These look amazing, I will be trying these for sure! !